Born in 1955 in Barcelona, Plensa studied at the Llotja School of Art and Design and at the Sant Jordi School of Fine Art. Since 1980, the year of his first exhibition in Barcelona, he has lived and worked in Berlin, Brussels, England, France and the United States, as well as in the Catalan capital. He has taught at the École nationale supérieure des beaux-arts in Paris and has regularly served as a guest professor at the School of the Art Institute of Chicago. He has also given lectures and taught courses at many other universities, museums and cultural institutions worldwide. 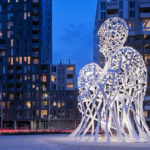 Jaume Plensa has received numerous national and international honours, including being named a chevalier of the Ordre des Arts et des Lettres by the French Ministry of Culture in 1993, and awarded the government of Catalonia’s National Prize for Fine Art in 1997. He was the recipient of an honorary doctorate from the School of the Art Institute of Chicago in 2005. 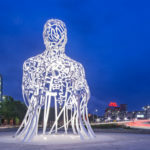 Jaume Plensa was also awarded Spain’s National Prize for Fine Art in 2012 and the country’s prestigious Velázquez Prize for the Arts in 2013. Source is installed at the main entrance to downtown Montréal, in a landscaped terrace at the intersection of Boulevard Robert-Bourassa and Rue Wellington. 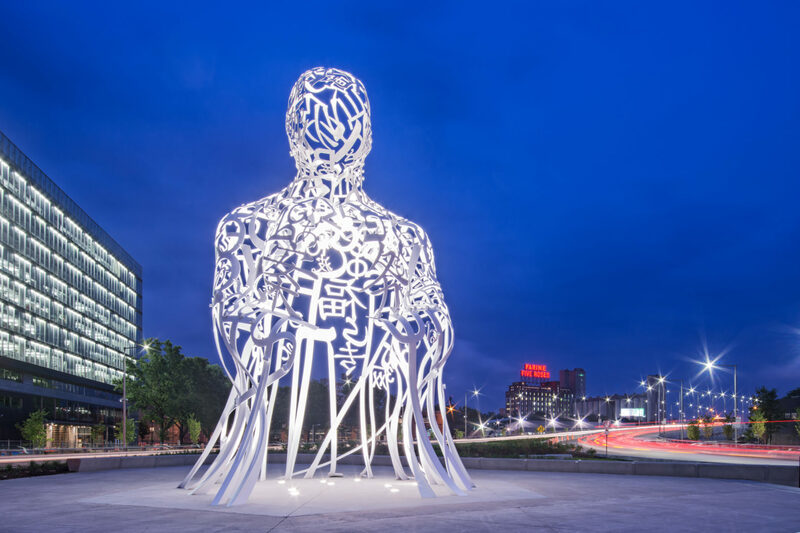 The stainless-steel sculpture consists of a random intertwining of letters taken from Latin, Greek, Chinese, Arab, Cyrillic, Hindi, Hebrew, and Japanese alphabets, combined to form a monumental figure in a sitting position. The work is an allegory for humanity: like cells are assembled to form the human body, the letters form words, and people form a community. Source represents the wealth of cultures that Montréal has welcomed during its almost four centuries of existence. A symbol of the city’s past, present, and future, Source, seen in the light of day or under its night-time lighting, invites residents to walk, dream, and meet. By creating Source for the 375th anniversary of the foundation of Montréal, the artist wanted to take into account the importance of water in the city’s history – for trade, immigration, and communications – but also the importance of the place of Indigenous peoples. Source, a word that is identical in French and English, refers to the birthplace of a watercourse, but also represents the roots of a city’s energy and vitality: its inhabitants and their origins, the fluidity and creativity of ideas, and the cycles of movement and renewal. 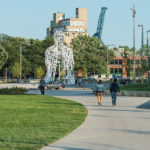 Source was created within the context of the redevelopment project for the south threshold of the Bonaventure expressway, constituting a legacy for the 375th anniversary of the foundation of Montréal. The integration of Source into the Bonaventure legacy was made possible through an exceptional contribution by the Chrétien-Desmarais family.